Every time I go to the farmers’ market I try to buy something new, something I haven’t cooked with yet. This week it was tomatillos. 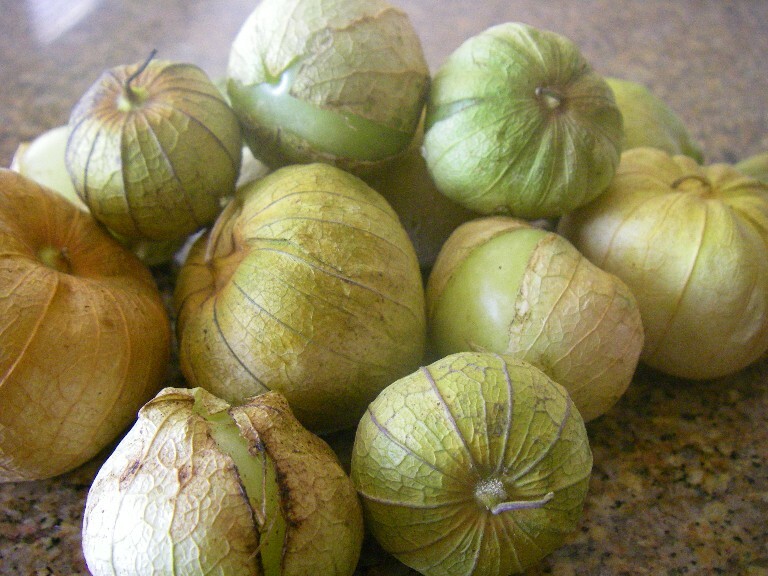 Tomatillos are a strange looking fruit. 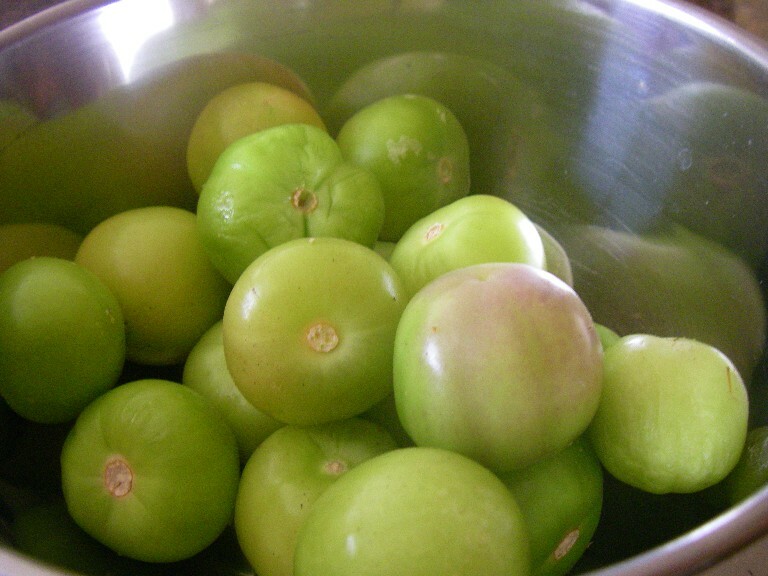 They look like small green tomatos, but they have a papery husk that you remove before using them. 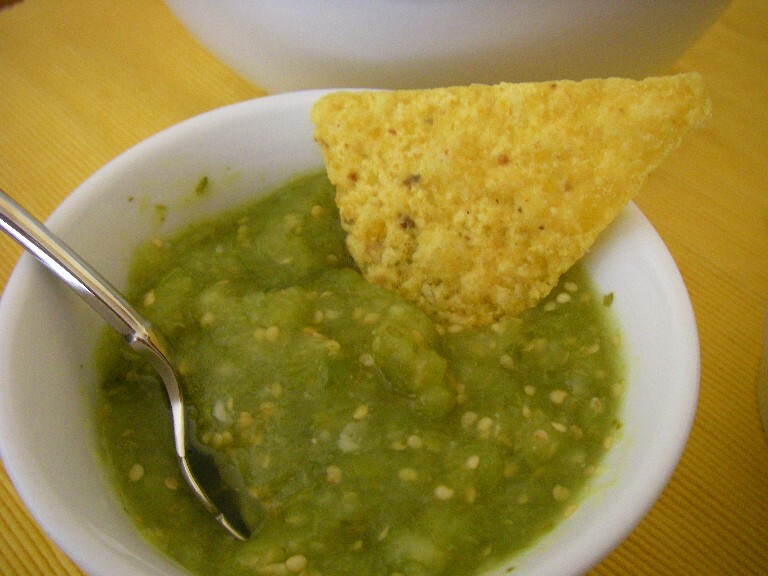 I made a tomatillo salsa on Saturday to go with the breakfast tacos (with homemade tortillas!) I made for breakfast on Sunday. I adapted a recipe from Vegetarian Cooking for Everyone. It was very easy to make. Place tomatillos in a saucepan and cover with water. Bring to boil and then reduce heat to low. Simmer for 10 minutes or so until the tomatillos turn a light green. Place tomatillos, jalapeños, onion, cilantro, and salt into a blender and puree. Place in refrigerator to chill before serving. Makes about 3 cups. Lately I’ve been buying our eggs at the local farmers’ market on Thursday nights. They are so pretty, but even better they are super yummy and fresh. I love the multi-colored shells and their yolks are the most brilliant yellow-orange and very firm. I haven’t been able to go the last couple of weeks. I bought two cartons tonight instead of my usual one. I don’t want to be without these! When I was expressing my love for these eggs to the farmer he told me he sings to the chickens every morning and “that’s why they taste so good.” Awww. This past weekend I created my first recipe. 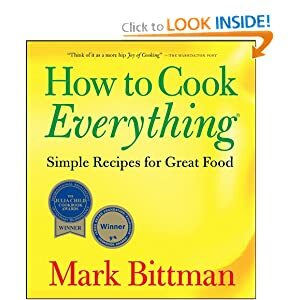 I was craving a pot pie with tofu and I couldn’t find a recipe that included everything I wanted: pie crust top, not biscuit or crumble, creamy filling, tofu, etc. I made a savory pie crust, sauteed tofu and veggies, made a béchamel sauce, put everything together–and YUM! It took longer than going to the grocery and heating up a frozen one, but it was definitely worth it. 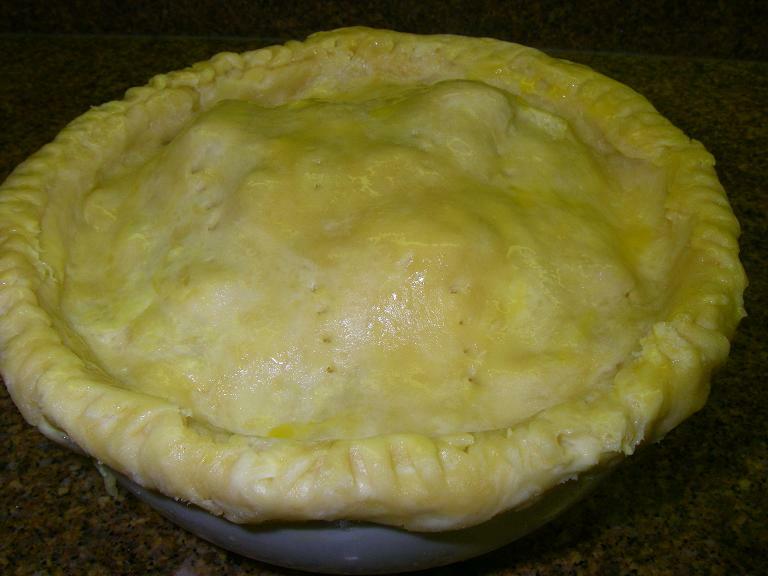 Makes two large-sized individual serving pot pies. 2. Add butter and using hands pinch butter into flour/salt mixture until small pea-sized butter bits are formed. 3. Add ice water and mix with hands until a ball forms. 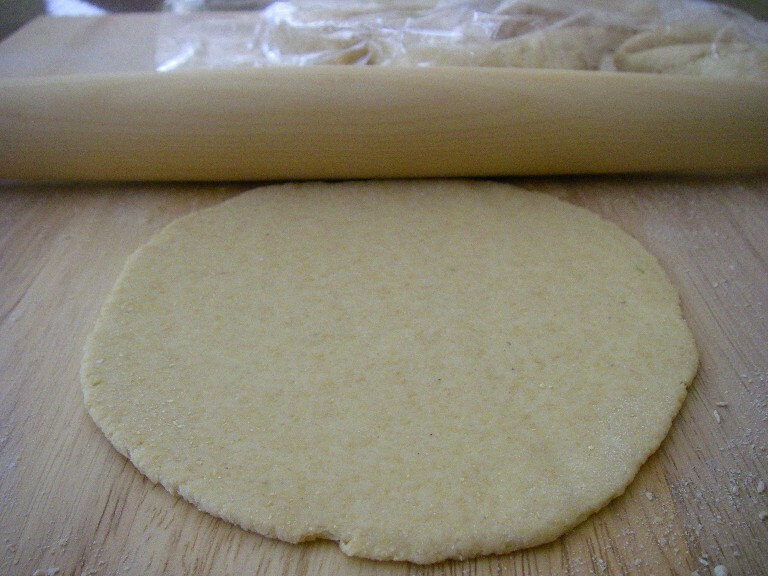 Separate dough into two equal parts, press each into flat disc, and wrap in plastic wrap. 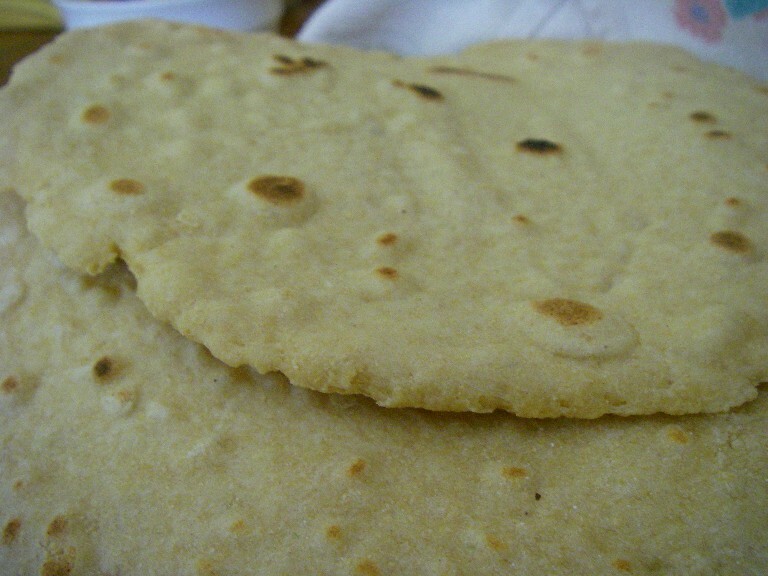 Place each into refrigerator and refrigerate for at least 30 minutes. 1. Add 2 tablespoons oil to a sauté pan and heat for a minute over medium-high heat. 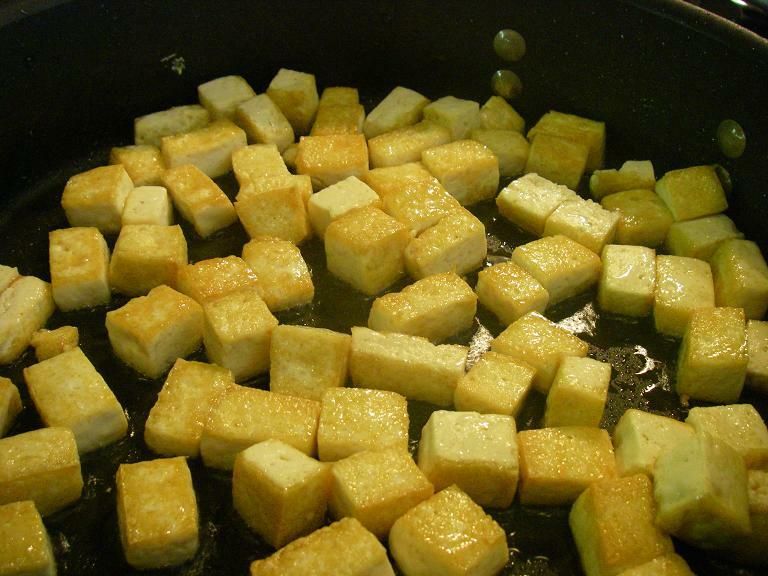 Add tofu, turning each cube when bottom is golden and crispy–about 3 minutes each side. When tofu is done, remove from pan, salt, and set aside. 2. Meanwhile, bring a large pot of salted water to a boil. Add potatoes and boil for 10 minutes. Drain and add salt/pepper to taste. Set aside. 3. Add the remaining oil to the sauté pan and heat for one minute. Add shallots. Stir and when golden add carrots and celery. 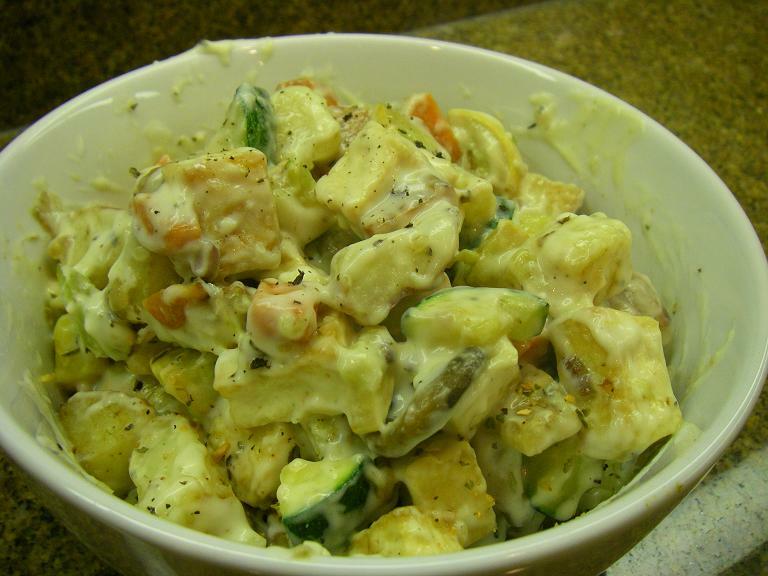 When carrots are soft add the zucchini, squash, and parboiled potatoes. When potatoes are crispy remove veggies to a medium bowl and season as necessary. Add tofu to bowl and mix. 4. Prepare Béchamel sauce and stir into veggie-tofu mix. 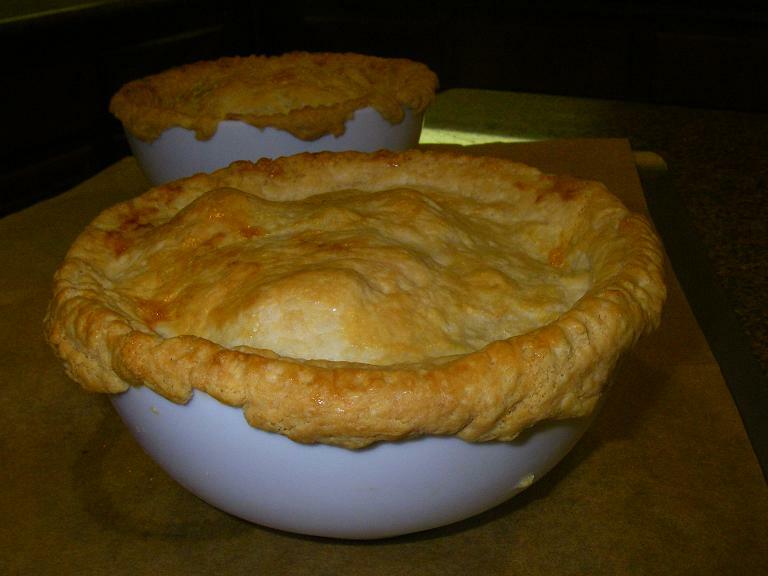 Pour into pot pie containers (I used two oven-safe bowls). 1. Melt butter over medium-low heat in small sauce pan. Add flour and whisk continuously for 3 minutes. 2. Slowly add milk a little at a time, still whisking until it is the consistancy you would like (I like it so it is pourable-the consistancy of warmed sryup). 3. Remove from heat and sprinkle with salt and pepper. Add to veggie-tofu mix. 1. Allow filling to cool to room temperature. 2. 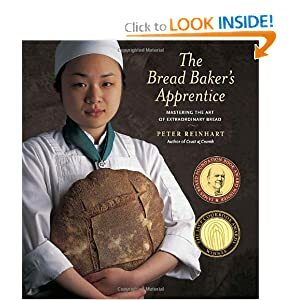 Preheat oven to 425° F. Remove pie dough from refrigerator and roll out each disc separately on lightly floured surface until large enough to fit pot pie bowl. 3. Brush each rolled out disc with the beaten egg and place rolled out dough over filled pot pie bowls with the brushed egg side touching the filling and crimp edges. 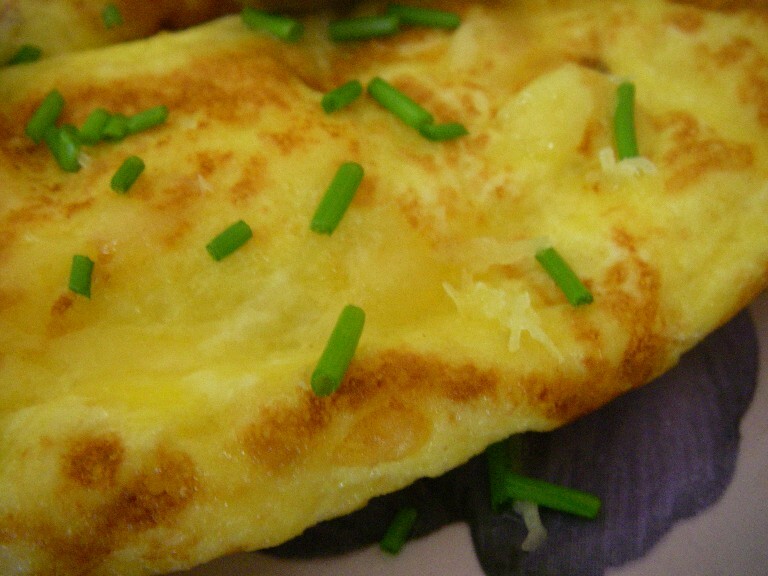 Poke holes in crust using fork and brush with the egg wash.
4. Place pies into oven and bake for 12 minutes. 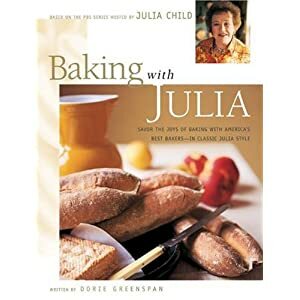 Immediately turn down oven temperature to 350º F and bake until crust is golden brown–about 20 minutes more. 5. Remove from oven and allow pot pies to cool on rack for at least 30 minutes. Bowls will still be hot, so place on plates and serve. 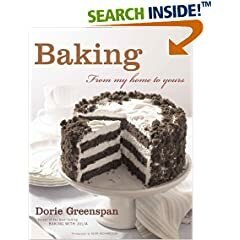 This week’s Tuesdays with Dorie recipe was a Chocolate-Banded Ice Cream Torte (Recipe #219). It’s also my first official TWD recipe. I made it using homemade vanilla ice cream. I decided on plain vanilla ice cream because I was making my own. I also 1/2’d the recipe because it’s just the two of us and ice cream cake is not something I can easily bring into work. I used a mini-springform pan and it worked out perfectly. I used the leftover ganache for my vanilla caramel fudge ice cream. 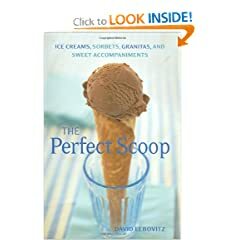 I’m cooking my way through David Lebovitz’s The Perfect Scoop. This week I made vanilla ice cream, Philadelphia-style page 25 (recipe # 218). Last week I made vanilla ice cream the French way. 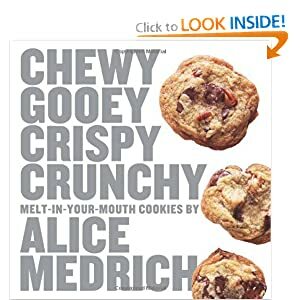 I thought nothing could top that recipe, but this one was absolutely delicious. I made the base the night before so it would be nice and chilly. I used half of it for an ice cream torte. I used the rest for my own version of vanilla caramel fudge (one of my favorite Ben and Jerry’s flavors). I used left over chocolate ganache from the torte for the fudge and made Salted Butter Caramel Sauce (page 174 The Perfect Scoop; recipe #217). I found pint-size ice cream containers at a local store.